Brazil completed a hat-trick of victories over Chile at the FIFA World Cup™ by beating their South American rivals 3-0 to set up a mouthwatering quarter-final meeting with the Netherlands. Dunga's side took control of the Round of 16 contest with two goals in quick succession in the last ten minutes of the first half through Juan and Luis Fabiano. Robinho added the third to inflict further punishment on the Chileans who may have ended a 48-year wait for a FIFA World Cup win in South Africa but evidently have not worked out how to better their old nemesis. Brazil defeated Chile in the 1962 semi-finals and at this same stage of the 1998 tournament in France, scoring four goals in each game. They also beat La Roja home and away in qualifying for South Africa and even in the goalless opening 33 minutes at Ellis Park, there was scant evidence of a different outcome. Although Chile, playing in all white, had a larger share of possession in the opening quarter-hour, Brazil carried the greater goal threat from the off. Luis Fabiano had an early sniff of goal when breaking down the inside-right channel in the fifth minute but dragged his shot past the far post. Four minutes later Gilberto Silva drew a full-length stop from Chile custodian Claudio Bravo with a 25-yard strike and from the ensuing corner, Kaka – back from suspension – had a sight of goal but fired wide. There was another nervous moment in the Chilean penalty box when Lucio took a dramatic tumble under Pablo Contreras's challenge and it came as no surprise when Brazil made the breakthrough in the 34th minute as Juan rose high to bury a header high past Bravo from Maicon's flag-kick. Four minutes later Dunga's men had their second as Luis Fabiano got on to the end of a slick counter-attack to hit his third goal of the finals. 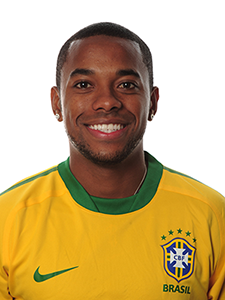 Robinho surged down the left and slipped the ball infield to Kaka, who split Chile's central defence with a first-time pass to put Luis Fabiano in the clear. With Chileans appealing in vain for offside, the Sevilla marksman rounded Bravo and slotted home. Chile produced only one or two promising moments in the final third in the opening 45 minutes. And when Humberto Suazo, making his second start of the finals, had a sight of goal, he failed to trouble Julio Cesar with his shot from the edge of the box – their only effort on target before the break. Marcelo Bielsa's side had begun the match showing four changes from the defeat by Spain, three enforced by the suspensions of Marco Estrada, Gary Medel and Waldo Ponce. And they began the second half with two more changes as Bielsa sent on Rodrigo Tello and Jorge Valvidia in place of Contreras and Mark Gonzalez. But though they tried to increase the pressure on Brazil's back line, their own defence was breached again just before the hour. Ramires strode forward from midfield, leaving two white shirts in his wake, and played in Robinho to curl a shot past the left hand of Bravo. It was Robinho's eighth goal in six matches against Chile and he came close to adding another with a low shot that Bravo tipped behind. At the other end some of Chile's approach play was slick and they began belatedly to create chances. Valvidia flicked up the ball on the edge of the box and lifted a shot narrowly over the crossbar. With 15 minutes remaining Suazo then produced a smart turn to escape the shackles of Lucio but his shot was comfortably dealt with by Julio Cesar. He got even closer with a sliced effort that looped on to the top of the crossbar but it was not to be. Brazil march on.